As the flu season ramps up, facilities managers and custodial staff are increasing the frequency of cleaning activities to combat the challenges of the, often deadly, influenza virus. Over the last few weeks, the U.S. Centers for Disease Control and Prevention (CDC) has reported a sharp spike in confirmed cases of influenza, as well as widespread rates of infection across 48 states. 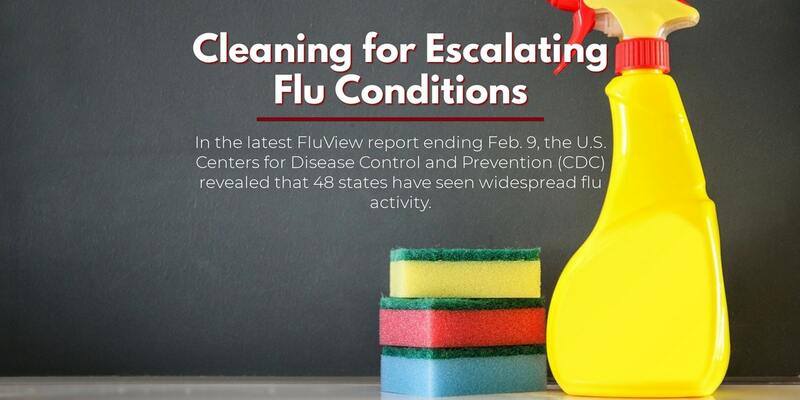 In the latest FluView report ending Feb. 9, the U.S. Centers for Disease Control and Prevention (CDC) revealed that 48 states have seen widespread flu activity. In fact, there are a reported 6,868 confirmed flu-associated hospitalizations from Oct. 1, 2018, through Feb. 9 — an overall flu-associated hospitalization rate of 23.8 per 100,000 population. In addition, 26 states reportedly experienced high influenza-like illness activity for the week ending Feb. 9. Eight states experienced moderate activity; 11 states experienced low activity, and five states experienced minimal activity. Six pediatric flu deaths also were reported to the CDC for the week ending Feb. 9, bringing the total number of pediatric flu deaths to 34 for this season. A common approach that has some merit when leveraging conventional commercial cleaning products and equipment is to increase the frequency of cleaning and disinfection practices--traditionally referred to as infection control procedures. To halt the spread of germs and dangerous bacteria in schools and office facilities, it is critical to understand the difference between cleaning, sanitizing, and disinfecting. Cleaning - This should always be step one, and consists of removing dirt, soil, and grease that reduces the efficacy of sanitizers and disinfectants. While the process and chemicals can remove some germs and bacteria, it is not nearly as effective as disinfection, or even sanitization. Sanitizing - Sanitizing and disinfecting are often confused or used interchangeably in conversation, but there are significant differences that can impact the safety of your facility and the health of its occupants. Sanitizing, which should always come after cleaning to achieve maximum efficacy, does not kill germs or bacteria but instead removes them to a degree considered hygienic by health professionals. Disinfecting - Like sanitizing, disinfection procedures should occur after initial cleaning steps have been taken to ensure the efficacy of the application. Unlike sanitization, disinfectants kill germs and bacteria, typically eliminating them at a rate of higher than 99.99%. While the CDC does not recommend increasing infection control procedures during cold and flu season, it is worth pointing out that their recommendations are based on the assumption of the daily, top to bottom cleaning and disinfection of your facilities. For school districts and businesses that must budget their cleaning funds, increasing the frequency, especially in high-traffic areas or where food is consumed, is a proven method to reduce the presence of the cold and flu, both of which can remain infectious in the air for several hours, and on surfaces for 24-48 hours. [...] facilities should err on the side of caution when disinfecting — especially during cold and flu season. During this time, disinfecting should increase for high touch surfaces such as door handles, drinking fountains, door push bars, restrooms, nursing stations, preschools, and daycares. Facilities with shared spaces should also amp up disinfecting programs. Make sure to wear appropriate protective equipment. Remember to disinfect instead of sanitize. Use microfiber towels to increase the efficacy of cleaning and disinfection procedures. Use disinfectant wipes on identified germ hot spots regularly. One of the key elements to ensuring a safe and practical infection control program is to first identify the type of infection and then strategically implement a focused removal using scientifically validated chemicals and procedures--meaning, don't chemical bomb the enitre facility with bleach. Doing so, especially in a haphazard fashion, runs the risk of cross-contamination issues (spreading the germs instead of killing them), as well as decreases indoor air quality and can contribute to a host of new health issues, especially in those who are already infected or with compromised or weak immune systems. The best method is to outsource your facilities routine infection control procedures to an experienced vendor with a proven track record for success and customer service.